Fun With Science Programs helps your child learn in a fun and educational way. This unique, lively and engaging educational program provides children with a dynamic approach to learning about ancient Egyptian life. This fast paced program focuses on exploring what everyday life was like for ancient Egyptians and offers children the opportunity to have a hands-on experience. This program was originally designed for Middle Schools, who traditionally have Ancient History in it's curriculum but Paulette can adapt the program to be developmentally appropriate for any age group. This video is full of interesting and informative insights on life and times of the ancient Egyptians. From their truly magnificent religious temples, to a more intimate look at their habits, beliefs and daily concerns. 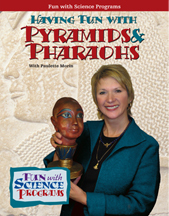 Its is a perfect follow-up to the Having Fun With Pyramids & Pharaohs program. For more information about programs and fees please feel free to contact me.